The Bic pen brand is in trouble with women again. You may recall a few years back when Bic released a new line of PINK pens designed “to fit comfortably in a woman’s hand.” The ensuing backlash led to an official apology from the brand and some pretty hilarious reviews on Amazon. Well, Bic is at it again. In an effort to celebrate Women’s Day in South Africa, the global brand created a poster that was shared through their social media pages. 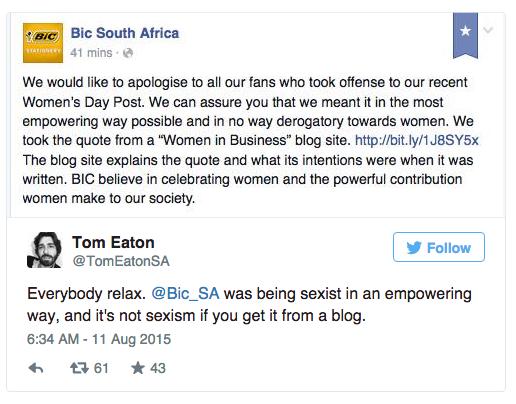 Unfortunately for Bic, the poster didn’t so much as celebrate women as it did insult them. As you can imagine, nearly every line of this poster has elicited the ire of women everywhere. From the notion that WOMEN should look like little GIRLS in order to impress – to the idea that a brand should tell women to ACT lady-like. And, of course the absolute insanity of instructing women to THINK like a MAN in order to work like a boss; there really is no end to the epic failure of this ad. That said, the lesson to be learned here is simple: products that are used in the same way by both genders don’t need some pithy prose separating them from each other. 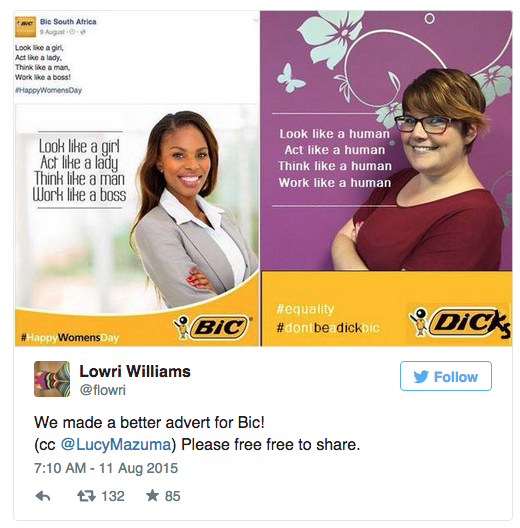 Had Bic simply celebrated women for being themselves, there would have been no issue. 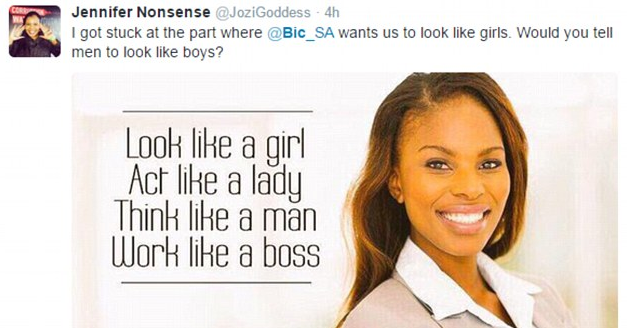 The moment Bic tried to offer advice on how women should dress, act or think, they lost. So, next time, copywriters – ask yourself “does this single out one gender and treat them as less-than?” and “Am I telling someone – anyone – what to wear, how to act (beyond a normal CTA) and how to think?” If the answer is yes, then tear it up and start over again because you are doing it wrong. Previous Post: Is A Presidential Run Just a Publicity Stunt Now?